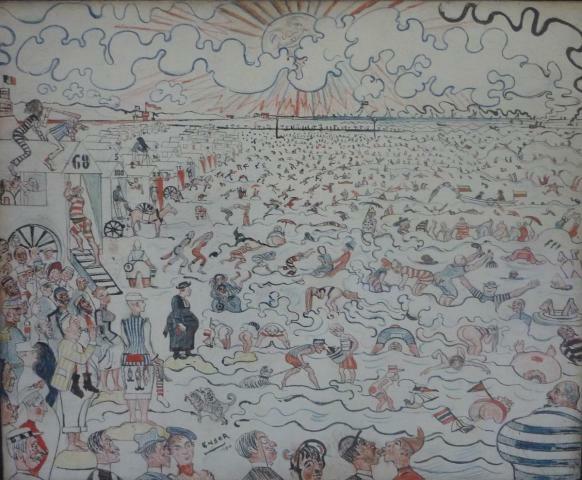 The Flemish Community announces the purchase of one of James Ensor's top works, Les bains à Ostende (The Baths of Ostend). Up until now, the 1890 work was part of a private collection. 'This was an opportunity to keep a top work of the Ostend master within Flanders and to supplement the 'Flemish Collection'', said Flemish Minister of Culture, Joke Schauvliege. List of Items of Exceptional Importance and Masterpieces currently contains some 347 works and a 230-count collection. There are 19 works by Ensor (and the KMSKA-drawing collection) on the list. Les bains à Ostende is 37,5 by 45,4 cm and is signed and dated by the painter in the middle (1890). Until quite recently, the work was part of a private collection. It was purchased now for 1.330.000 euro. It is a sparkling, mildly satirical and compelling sketch of the fin-de-siècle frenzy of Ostend's Bath. The work is seen as one of the public favourites from Ensor's oeuvre.